Global Power Book 2016; New Fenton CEO; World mourns Muhammad Ali; Former Verizon pitchman defects to Sprint; Sanders camp split on sticking around after California votes. PRWeek’s guide to the most powerful communications professionals around the globe is live, along with insights from PR executives about what they expect for the rest of 2016. Good news: more than three-quarters of the list’s members think this year will be better than the last for business. Lawyer and author Michael Huttner has moved into the CEO role at Fenton. David Fenton, who founded the firm in 1982, is staying on as chairman. Most recently, the new chief executive was the president of Huttner Group, based in Boulder, Colorado. He also founded ProgressNow, a network of state-based communications hubs. Fenton has offices in New York, Los Angeles, San Francisco, and Washington, D.C.
People around the world mourned the loss of boxing legend, humanitarian, and activist Muhammad Ali this weekend. Family spokesman Bob Gunnell, the founder of Louisville, Kentucky-based BoxcarPR, detailed the three-time champion’s final hours in a Saturday press conference. 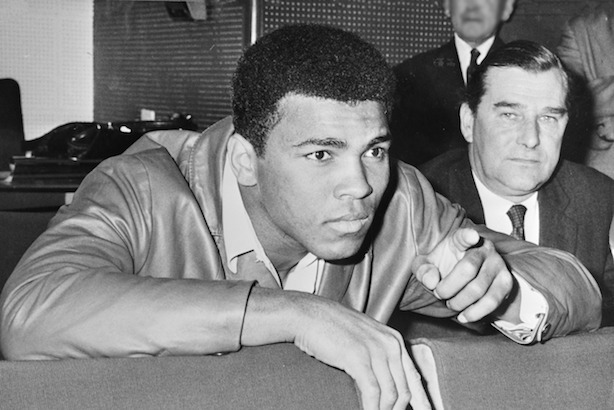 Industry veteran Alan Taylor recalled publicizing the bout between Ali, then known as Cassius Clay, and Sonny Liston in 1964. Paul Marcarelli, who did his last ad for Verizon in 2011 with the catchphrase "Can you hear me now?" is now working for rival Sprint. New ads debuted Sunday night during game two of the NBA Finals. Marcarelli was voted "Most Mysterious Pitchman" by Entertainment Weekly in 2002. Sprint also bought the promoted hashtag #TheSwitchIsReal on Twitter on Monday morning. Will Sanders stick around after Tuesday? Hillary Clinton moved to the precipice of clinching a majority of delegates needed to seal up the Democratic nomination on Sunday night when she won Puerto Rico’s primary. Voters in California and New Jersey could put her over the top on Tuesday. Staffers in Bernie Sanders’ campaign are split on whether the Vermont senator should drop out after voters go to the polls on Tuesday, according to The Wall Street Journal. Republicans, meanwhile, are worried about the impact of Donald Trump questioning the impartiality of judges based on their ethnic and religious backgrounds.